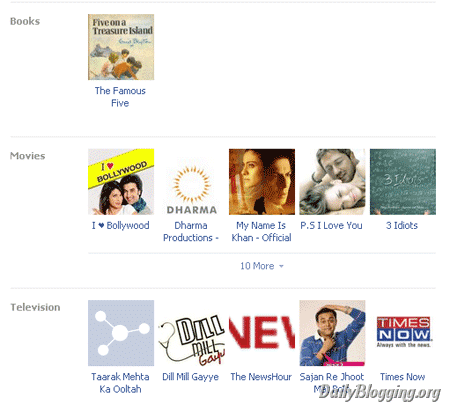 From Couple of days, there were many people out on Facebook, who were giving out varied reactions about the revamped Profile pages. An hour ago I saw the new Profile page & updated it right away. They have made major changes in the design. A few months ago we had seen that facebook removed the Application Profile Boxes from the sidebars of the profile pages. In the revamped layout we see that the Friend’s box no longer exists, instead our friends are listed in a list view. Facebook has officially announced that they won’t provide an option to roll back to the old design once you’ve upgraded. The process of rolling out has just started. So if you want to experience it before hand, then navigate to the About Profiles page & click on the green colored ‘Get the New Profile’ Button. Lets list out the major changes brought out in this new layout. Few years ago we used to fill in the Description box on Orkut & style it up with color codes. But the Description present in that text area was no where close to our description. All crappy things used to be written there. 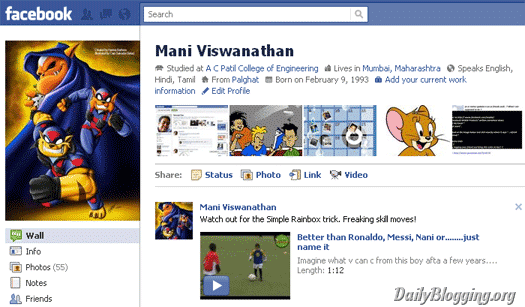 The new layout of Facebook will give you a detailed point to point Description of a profile. Check the image above for a better idea. Yes, we had this feature in the previous layout too. But this time we don’t need to click on the “See Friendship” tab & navigate to a different page. 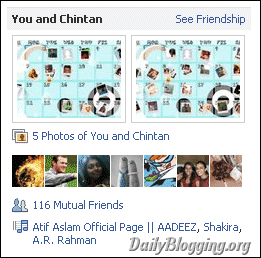 You will be able to see the Friendship between you & your friend on the right side of your friend’s profile. The Friendship box gives only an insight. You still need to navigate to the “See Friendship” link placed in the box, to get a detailed view. Now the information appearing under your Info page will have thumbnails instead of text. It means that when you enter a movie name, facebook will perform a search to find whether there is a page relating to that name. Once it’s found you’ll be able to link it. Also you can change which Movie or Sport or Interest you want to display first. Facebook says that this feature will help in connecting with people of same interest/activity. There are many changes in the new layout. But I have listed only the major one’s. To find more you can go to the About Profiles page & upgrade your profile to the new layout. 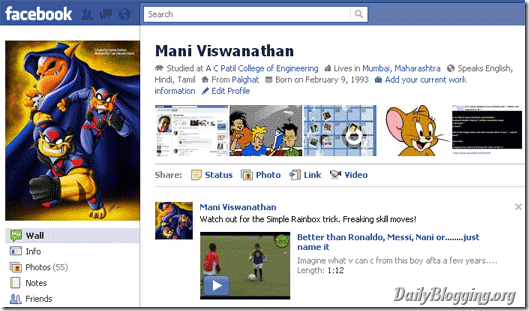 If you like the post then you can Like DailyBlogging’s Facebook Page too. Do you like the new Profile Page Layout ?? This new facebook profile seems interesting as how do you write here. I will check it. for the little amount of time I spend on facebook I don’t think this will affect me much. To be Frank I haven’t even noticed anything change. I think I may had seen a friend doing something with the friendship box but I haven’t caught on yet lol. I liked the old design much better.. I recently switched to new profile But not sounds good.Now I am looking for how can I get back to my old style. I too didn’t like it much.